My dilemma when booking the hotel was to either go for a cheaper solution and stay in Rimini (40 mins drive from San Marino) or to pay more but stay right in San Marino town. I opted for San Marino because I really wanted to stay there and it made more sense to be close to the hotel because of the baby. And that was an excellent decision. We were never more than 10 minutes away from our hotel. Yes, that’s how small and convenient San Marino is. I hit the jackpot with the hotel because I chose one of the rare hotels that are actually within the old town walls and our hotel room had a superb view. One of the benefits of small countries and small towns is that you can actually see everything of merit within a day or two. 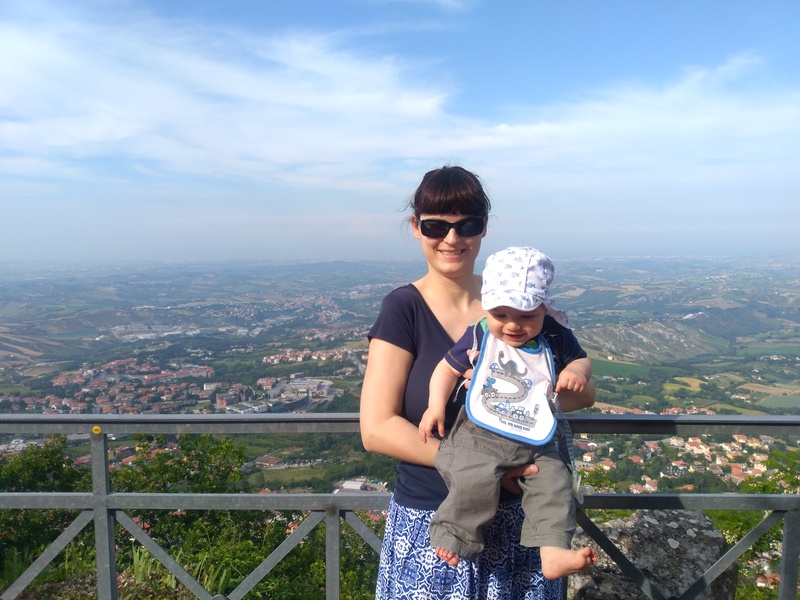 San Marino is a great place for a day trip but after spending two full days there (and three nights) I feel that it’s better to stay in San Marino for two days and explore it properly without the hurry. We managed to see all the major sights and still pop into the hotel for nappy changing and feeding and some rest. Another bonus of staying overnight in San Marino is that you get the town to yourself (almost). It is practically deserted in the evenings after 8 pm when all the day trippers leave and the locals go home (most live outside the city walls). However, all the shops close by 8 pm and most of the bars & restaurants too. But you still have a choice between a few lovely restaurants for a dinner or just drinks. I think more people visit San Marino during summer months because it wasn’t very crowded during our visit but I got the feeling that it gets much more visitors. So May was a good time for a visit but it was already very warm. All in all, we had a lovely time in beautiful San Marino. I think our baby V. liked it too. I’ll be writing about landmarks of San Marino and our itinerary in future posts. What a fantastic place for your first family trip! I totally agree that road tripping in the way to go with very little ones. Our first family trip was a road trip around Scotland. Hello! 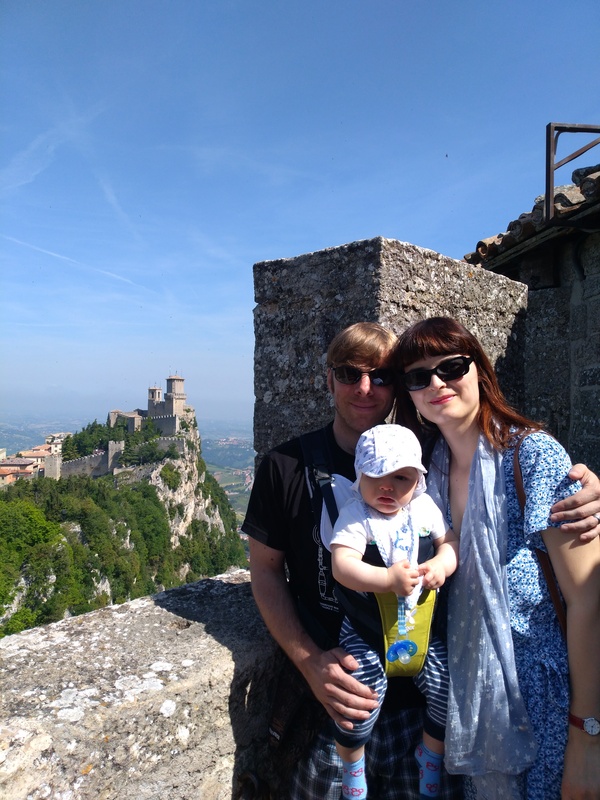 I just had to comment on your great post as four years ago we chose San Marino as our very first trip with our first baby!!! This is such a good, practical idea – and such a lovely place to go to! Sounds like it was an awesome experience. Sounds like a lovely trip! I definitely want to visit San Marino one day. Looks like a lovely trip. Glad it worked out so well. Of course it’s easier with a 6 month old baby than a toddler who is super active and on the go! I had not heard of San Norino before but now Ill check it out on the map!